There’s no getting away from it. 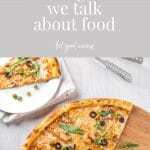 Because we eat food, it is inevitable that we are going to talk about food. 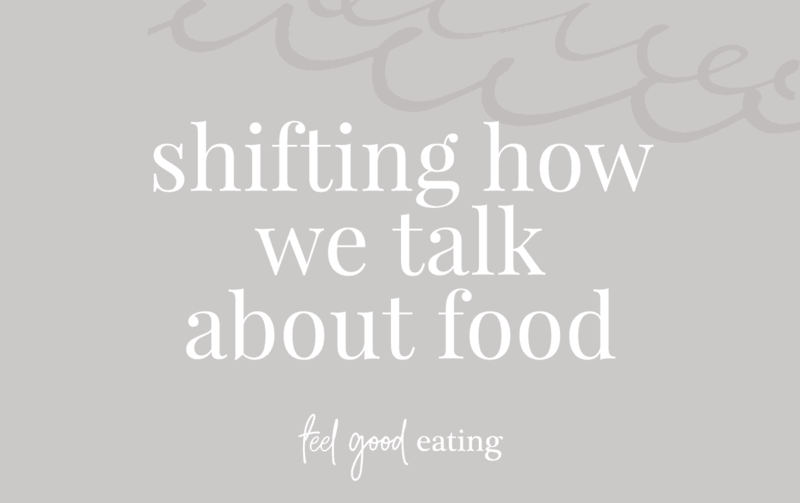 And because we are all by default, immersed in diet culture, how we talk about food is no longer a neutral subject. You might have noticed that they are descriptors that have roots in morality. Which would be fine, except that as humans, we tend to internalise these moral judgments about food onto ourselves. What we choose to eat or not eat becomes an extension of our moral character. Diet culture has taught us to think of ourselves as morally superior if we eat “clean, good food” and we are less than if we eat the food we consider “bad”, “addictive” and “sinful” (For a fascinating exploration of this topic, check Episode 94 of Food Psych with Christy Harrison and Alan Levinovitz). Food does not deserve to hold that much power over us. 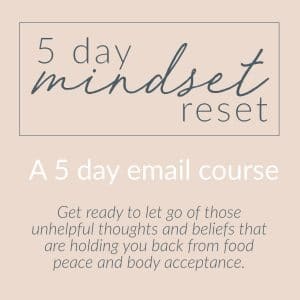 Principle 3 of Intuitive Eating (aff link) invites us to Make Peace with Food – specifically through shifting from judgement to unconditional permission. Making peace with food means dropping all of those moral labels. Food is just food. This shift also means that there is no need to classify foods into categories of ‘sometimes’ and ‘everyday’ or ‘more nutritious’ because all food is on the table. Labels like ‘discretionary’ and ‘whole foods’ become redundant as they continue to add judgement and moralisation to the actual food. Note that some of these ways of talking about food aren’t positive – but what they aren’t is judgemental. 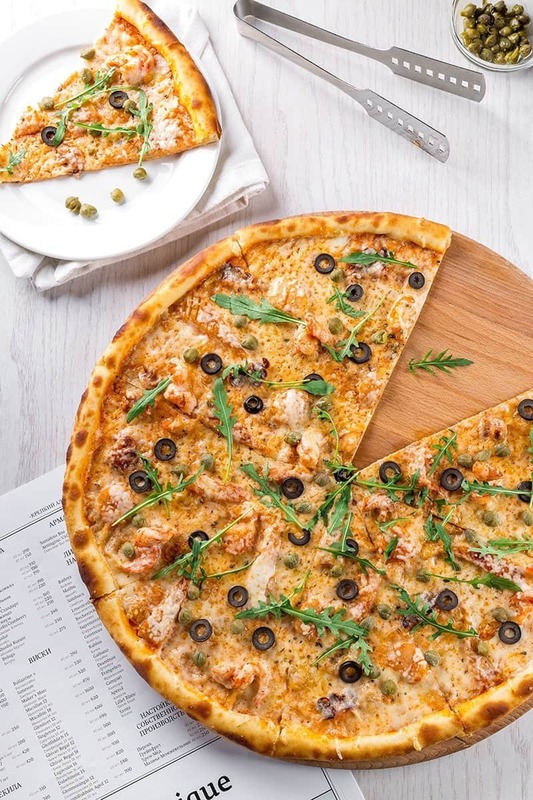 Eating a food that gives you heartburn doesn’t confer anything about the type of person you are – it just means that you might experience heartburn after eating that food. Talking about food in this way is also based on an individual’s own internal experience with that food. For example, food that is considered ‘filling’ for one person is going to be different for another person. They provide information to help inform food choices in the future. 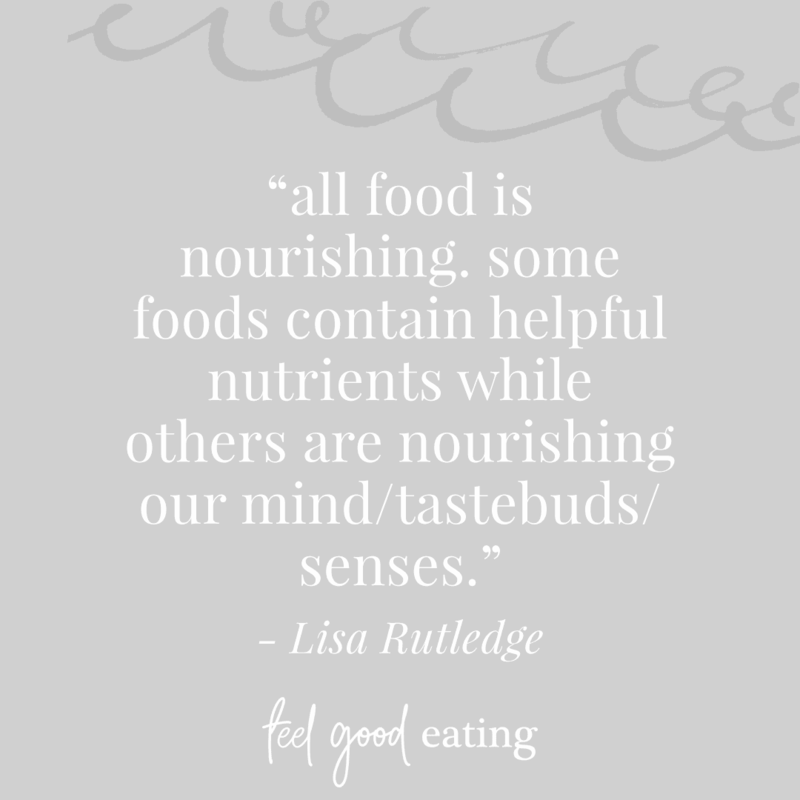 Removing the judgement from how we talk about food is an important part in accepting unconditional permission to eat all foods and ultimately healing our relationship with food. what are some ways that you would describe food that have nothing to do with moral value? Love this post! Such an important topic. This is a great post. So many people have an unhealthy relationship with food. Its a nice way to list off other ways to think about it. I like the sensory list too.